An access crossing of the canal has been constructed, with the ramp down into the culvert completed. Footers have been formed and concrete has been poured on both sides. A curved steel plate has been ordered to span the breech. When manufactured and delivered it will be placed and secured over the culvert. The area will then be back-filled, the towpath rebuilt and refilling of the canal will be attempted. 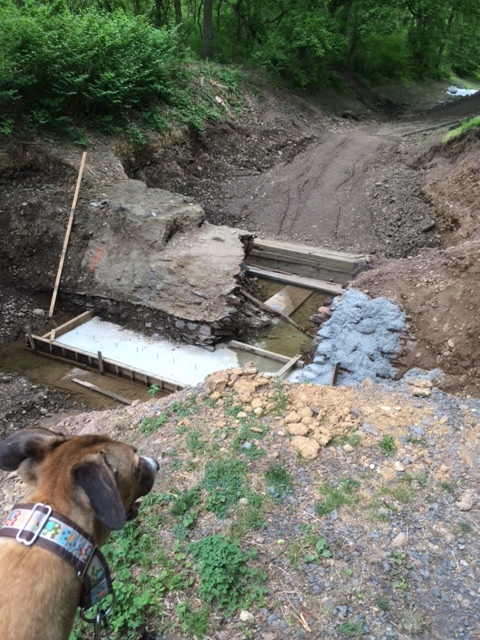 DCNR has appropriated funds for the repairs, according to Mr. Dalton. The Friends of the Delaware Canal (http://www.fodc.org/) have provided substantial financial support for this project, as well. Bi State Construction Co., Inc. of Easton, PA will execute the temporary repairs.